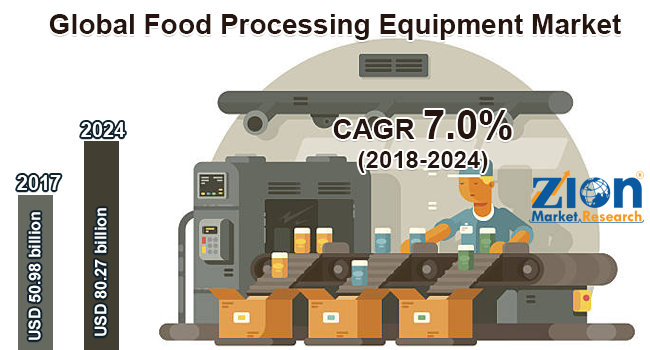 Global food processing equipment market expected to reach approximately USD 80.27 billion by 2024, growing at a CAGR of around 7.0% between 2017 and 2024; Global food processing equipment market is determined by the other key factor such as growing demand for the dairy, meat & poultry, and seafood products across the world. The report covers forecast and analysis for the food processing equipment market on a global and regional level. The study provides historic data for 2015, 2016, and 2017 along with a forecast from 2017 to 2024 based on revenue (USD Million). The study includes drivers and restraints for the food processing equipment market along with the impact they have on the demand over the forecast period. Additionally, the report includes the study of opportunities and threats to the food processing equipment market on a global level. To understand the competitive landscape in the market, an analysis of Porter’s Five Forces model for the food processing equipment market has also been included. The study encompasses a market attractiveness analysis, wherein equipment type, and application segments are benchmarked based on their market size, growth rate, and general attractiveness. The study provides a decisive view of the food processing equipment market by segmenting the market based on equipment type, application, and regions. All the segments have been analyzed based on present and future trends and the market is estimated from 2018 to 2024. Based on equipment type, the market is segmented into mixers, depositors, refrigeration, slicers and dicers, thermal equipment, extruding machines, and others. Based on application, the market is segmented into the dairy sector, fisheries, meat and poultry, fruits and vegetables, bakery and confectionery. The report also includes detailed profiles of key players such as A&B Process Systems, Scherjon, SPX, Maschinenbau Rud Baader, Marlen International, Anko Food Machine Company Limited, Paul Mueller, and Bettcher Industries Incorporated. The detailed description of players includes parameters such as company overview, financial overview, business strategies and recent developments of the company. The detailed description of players includes parameters such as company overview, financial overview, business strategies, and recent developments of the company.